Chelsea face a potentially gruelling summer as the future of manager Antonio Conte and nine first-team players look in serious doubt, according to latest reports. The Blues have had a difficult enough season on the pitch and now face more problems off it as big change could be underway at Stamford Bridge this summer. According to the Telegraph, if the club choose to sack Conte as manager it will cost them around £9million to pay the Italian off – an added expense they could do without right now. On top of that, the report adds that star duo Eden Hazard and Thibaut Courtois may be less likely to sign new contracts with the club if they miss out on qualification for the Champions League. 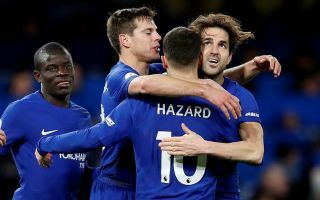 Cesc Fabregas, David Luiz, Gary Cahill, Pedro and Olivier Giroud are also a worry for Chelsea as they’ll all be entering the final year of their contracts in west London. Loaned-out pair Michy Batshuayi and Kurt Zouma may also be reluctant to return to the Bridge if they’re not given the chance to play more regularly. Given that Chelsea strolled to the Premier League title last season it is quite remarkable how quickly things have fallen apart under Conte. The Telegraph add that Luis Enrique and Thomas Tuchel would be leading candidates to replace the former Juventus boss.